Aging is a working process for all the living. Studies have revealed that aging develops due to many cellular and chemical factors; and inevitable although genetic structure, living conditions, nutrition habits, physical and emotional traumas lead to differences. The basic physiology of aging may be defined as slowing down of cell regeneration and inadequate cellular repair. Cell proliferation and elimination of tissue damage decrease with age. Slowing down or at least enabling recovery of tissue damage and thereby enabling a healthy appearance are among the targets of medical esthetic. PRP is a quite safe, successful and easy procedure used for this purpose. 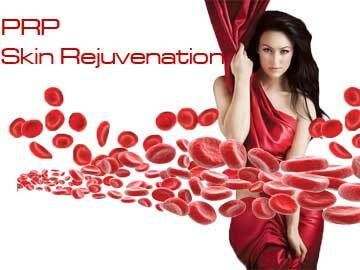 PRP means platelet rich plasma. Platelets are small blood cells which work for coagulation and tissue repair. These cells come to the region first when tissue damage occurs, bleeding starts. The first function is adhesion to the hemorrhage site and aiding clot formation. The second function is enabling the other cells which provide tissue repair to reach the damaged site. So tissue damage can be immediately repaired. Platelets were started to be used for medical esthetic procedures after their functions had been recognized.PRP targets administration of rich platelets to damaged site and thereby immediate tissue repair and revitalization. Why can the body not perform this itself? The quality of capillaries is impaired with age and cell proliferation decreases. Platelets and tissue repair factors cannot reach the damaged area. Recovery begins again when platelets are directly applied to damaged field with PRP. What are the medical esthetic applications of PRP? PRP is a safe, rapid method which does not impair daily life activities and comfort. The procedure begins with drawing about 100 cc blood from the patient. The blood is transferred into a special tube. The kits and the tubes are very important. The kit should be sterile, must be approved by FDA, it should be special PRP tube. It should yield the same outcome in each administration. The kit should separate more than 85% of the platelets. It should not contain EDTA etc. Therefore routine laboratory tubes cannot be used for this purpose. The tubes should be vacuum tubes and platelets should not be disrupted during drawing blood. These technical features are important for the success of the procedure. The application site should be administered anesthesia while platelets are being centrifugated. Anesthetic cream is applied to application site to eliminate pain. Platelet rich fluid is applied through a special system in the third stage. The procedure takes mean 60 min of which 20 min is used for anesthesia. The fluid which is administered to the patients does not contain any foreign bodies, it includes only the cells and plasma of the patient. So it does not lead to allergic reaction. Overdose does not develop. Whole of the obtained fluid may be applied. The only important point is kit quality. Many PRP kits of Far East region are available in the market however they do not have therapeutic effect. What should the intervals be for PRP application? PRP cures are composed of 3-4 sessions performed at every 20 days. Revitalization and healing are seen at the first session. PRP does not have a treatment protocol. The protocol is prepared according to the economic status of the patient after 3 sessions. One session may be applied at every 2-3 months. Who should not be applied PRP? In advanced cancer and in the diseases manifested by decreased platelet count. In conclusion, it is not possible to stop aging. PRP is an easy, safe and successful treatment modality which is used for elimination of the effects of aging. Price range is quite high depending on tube quality. The patient should inquiry the quality of PRP. PRP or Real PRP?